Grafton comes into the tournament unified and looking for another district championship. Just as we did earlier today with D2 Central/West, let's break down the D3 bracket, where reigning champion Grafton looks to make another deep run, and several other CMass teams look for their tournament moments. Here are some quick takeaways from the D3 CW bracket. These two teams met in the district final last season, with Grafton slowing down the prolific Mounties and winning 12-8. This season, Greylock is even better record-wise, but Grafton comes in having played one of the toughest schedules in Division 3. 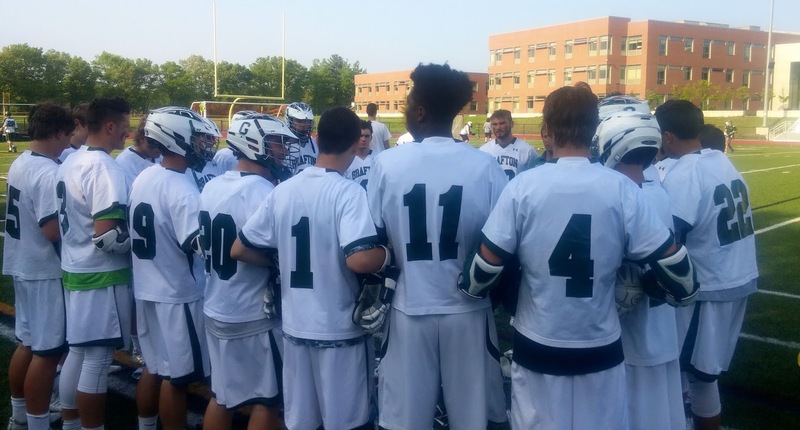 With wins over Division 1 playoff team Franklin, and D2 playoff squads Worcester, Tantasqua, Wachusett and Algonquin, the Indians should be prepared for another long postseason push. Grafton has been a little up and down this season, but the Indians believe they've found themselves after a late-season meeting, and several personnel changes, such as moving senior Chase Kapuscienski from attack to midfield, have already paid dividends. Nipmuc is one of the state's most improved teams, going from 6-12 a season ago to the 3-seed in this year's bracket. The Warriors are also closing the season strong, with an upset win over Grafton, a win over St. Bernard's, and narrow losses to Littleton and Tantasqua all in the last 10 days. If Ryan Richards and Mike Manning get going for the Warriors, they should again be a tough out for Grafton in the semifinals. St. B's is also enjoying a fine season, led by career 400-point scorer Curtiss Vachon. The Bernardians score nearly 13 goals per game, and have a big win over Worcester, as well as some close losses to D2 playoff teams, under the collective belt. 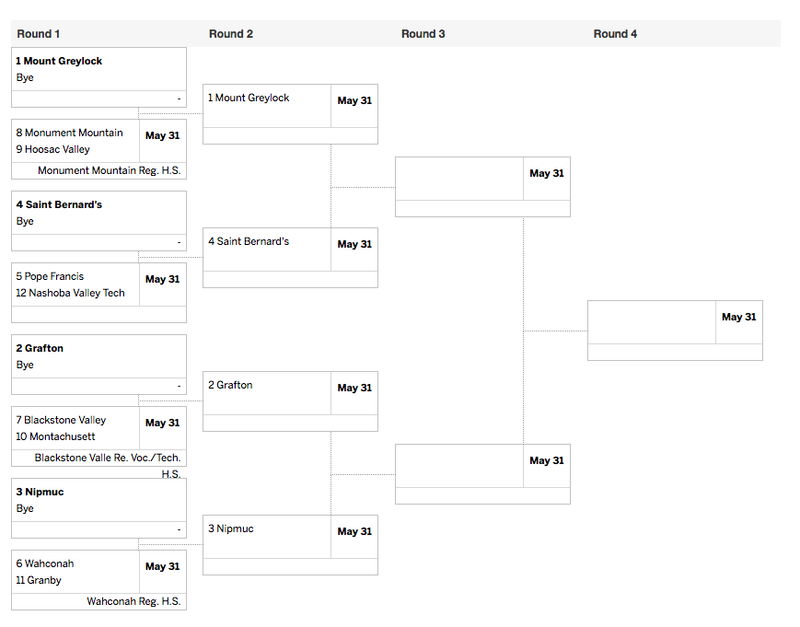 St. Bernard's gets a bye to start the tournament, then we could see the Bernardians in a potentially fun game against Pope Francis in the second round. I'm just going to skip ahead to game to watch, because I feel like both these teams were given a very tough draw, but have to be excited about their first round matchup. These two Colonial conference rivals played twice this year, with BVT getting the better of Monty Tech both times. The Beavers are led by the explosive Mike Jango, but come into the tournament with little momentum, after losing four of their final five games. The Bulldogs, meanwhile, are making their first ever tournament appearance, and would love to finally break through and beat BVT for the first time in program history. With Eric Glover enjoying a fantastic season, Monty Tech will have the firepower, and this one should be another entertaining affair. It will be another battle between Mount Graylock and Grafton for the final. Grafton's schedule is second to none in the region, if not the state. They play them all and either beat or hang with all of them. Msumba is the second best goalie in the region, Grafton's defense backs down from no one. Grafton's front line can score at will when on point. O'Brien and Deangelo can take it at the faceoff x. Grafton should be the favorite in this region and sould have shown the moxy by hanging with those on their non-league schedule to once again hook up with Dover Sherborn in the final. Graylock scores a ton of goals against a western Mass schedule consisting of teams like agawam E. Longmeadow, and South hadley. Should be a good game, but once again Grafton will advance. Grafton seems to welcome all comers and meets all challengers face on. Should be a good tournament. Good luck to all teams. Not trying to start a flame war and I know Laxpowers SOS ranking isn't 100% on the spot because it has a hard time calculating wins vs bad teams and loses vs good teams but Grafton SOS on LP is 30th in the state and the 7th amongst CMass teams. They are to be credited with seeking out top quality opponents from other regions, but their league schedule holds their SOS down. So yes, they play, beat and hang with some good teams, but it is not like they have a tough league schedule that may, or may not wear down a team over the course of a season. It has been batted around that teams only be required to play league opponents one in order for teams to go out and find more competition but we'll see if that ever goes through. So, again, please don't take this as a put down of Grafton. I am entirely excited for them and their continued success , however I think we all need a bit of perspective when talking about the "greatest" "best" "toughest" etc. they are clearly among the elite in CMass in both divisions. They clearly are in the elite in D3 state wide and surely in the near elite in the state at all divisions. I wish them and you (perhaps it's one in the same) the best as the tourney commences. Compared to d3 central west teams their schedule is way tougher. 4 out of 6 teams in Mid Mass made playoffs, so their league must not be too bad. Know your facts before u say their league schedule isn't "tough". They certainly do have the toughest D3-CW schedule. The toughest D3 schedule in CMass. As stated, that is great credit to them. As to their league though they were 9-1. Outscoring their league opponents 126-37. So, yes, 3 of those other teams made the tourney, a testament to them and the growth of Lax in Cmass, but the GF vs GA doesn't say "grueling" or "tough." If this sentiment is wrong, even with the tremendously tough non league schedule (again, applaud and awesome for them), the impartial LAXPOWER computer computations have their overall SOS @ 30 and 7 as stated before. SO the FACTS are stubborn things. The waltzed through their league. Thus allowing them to seek out that impressive OOC, OOL, OOD schedule! All the credit to them. Great job St B's, beating the obnoxious Pope Francis team!!!! Hopefully this will shut them up about their "studs" putting up 10, 12, 16 pts in a game against overmatched teams. Can't do that to a CMass team. Tools. Again. Great Job St Bs. Keep it going.